Also, your description of the recent Cleveland trip was interesting. Sounds like a very good experience. One particular thing: TSA and flying. When you presented yourself as shown in your pictures, did you merely show your male identification and then simply pass through to your gate? Was there any question or hesitation whatsoever in the procedure? There was no difficulty either flying out of West Palm Beach or my return out of Cleveland. And yes, that was my travel in outfit at The Rock and Roll Hall of Fame, and my fly back outfit in the photo shown here. On the return I had on full makeup and an underwire bra (that was not intentional). I presented my Florida male driver’s license (DL), and boarding pass and with no question pass through the identification part with no comment from TSA agent or explanation from me. I had a somewhat large carry-on and it was flagged for an inside bag check. A bag of M&Ms inside the carry-on. The female agent helped me with the bag (honey this is heavy) and smiled as she found the M&Ms; “This was it.” Off to the gate I went. At the most recent SCC transgender conference in Fort Lauderdale, a very high TSA official in traveler relations spoke and described the process in detail. This was my take-away. Please do not quote me as to this being actual TSA policy. She said they are aware of transgender passengers and their procedures being daunting and somewhat invasive. They strive to be understanding and accommodating 100% of the time. She also stated that people are imperfect, have bad days and sometimes problems occur. Keep in mind that there are camera’s everywhere. We know it and they know it. Every complaint of merit according to her is reviewed and they have 30 days of tape always saved. She encourage anyone filing a complaint to speak up early. Don’t wait 6 months. Here is the process as she described it: It is a two-step entry into the boarding area. The first step is checking credentials. Making sure the photo ID (DL or Passport) matches the boarding pass and person matches the ID. Only one small spelling mistake is allowed and you could be ask to show another photo ID if the first in not acceptable. Only in Canadian Customs was I told that my passport photo did not match my appearance. A supervisor cleared me immediately by saying that the her Passport photo is old. “She is good to go” in spite of everything stating male – Thank you. No US airport has ever questioned me. There is one very funny story that I will relate later. The second step is the bag and body screening. ID at this point is irrelevant. Bags go one way and you go the other. This is no place to be cute of funny. You don’t have to look hard to see that these people are sick and tired of a job no one appreciates. Just get through the process with all the dignity that is possible. 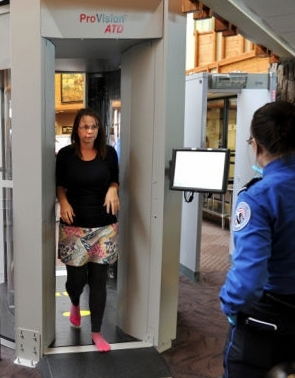 The TSA agent operating the body scanner will choose either male or female based on observation and the scanner will note abnormalities; Keys in pocket, metal belt, cellphone, underwear bomb. If necessary, a secondary metal detector “waning” or pat-down search can be done inline or in a private room. According to our TSA official at SCC - Your call on where and the gender of the person doing the pat-down. I have never been subject to secondary check or random check. Yes and one other time I did forgot a bottle of water and the bag was flagged, checked, water tossed and the bag was re-X-rayed. On my way. Keep in mind that at the ID check point a smile and present attitude goes a long way. Because of so much frequent travel, I get Pre-Check about 50% of the time and do like the convenience it offers with the lines. Maybe I will purchase it someday. That is my experiences over many years of travel since 911 and I do not let TSA deter me from being who I am. You mileage may vary. TSA has a job to do. I have a place to go. Hi Rhona, this is also Kimberlys findings on her ‘fly pretty’ site where she records all the trips she does all over the US for work which she often does en-fem .. I often fly Fem in the UK and have never found an issue, and as you say, smile and be polite goes a long way to help with the people who are there to protect us and are just doing their job. Feminine Differential - How Feminine Are You? Political Soap Opera - Or Not? I Voted - Hope You Did? Vote Like Your Rights Depend On It.